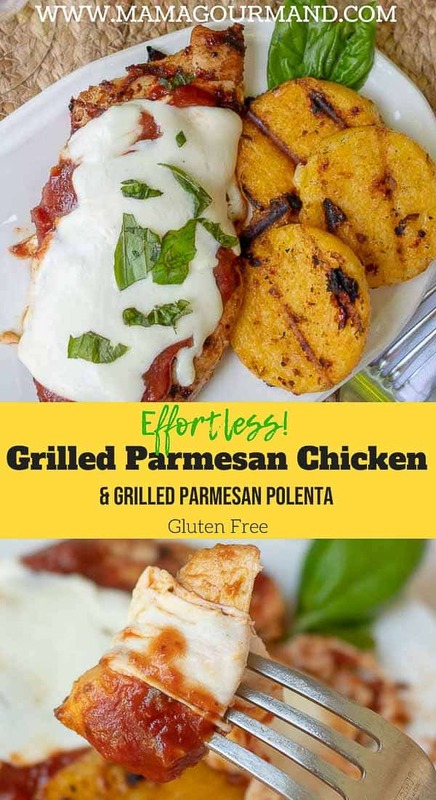 Grilled Parmesan Chicken tastes just as heavenly and comforting as traditional parmesan chicken, but without the extra calories and effort. 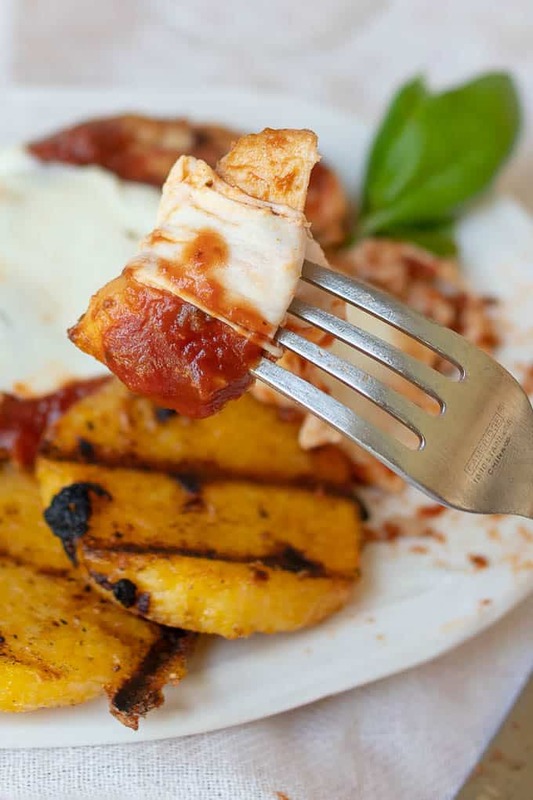 This easy summer recipe makes grilled parmesan polenta along with it for a whole meal in one! I believe we all have quirks when it comes to what kind of recipes we’re willing to make. Some people might be put off by complicated steps, buying a ton of ingredients, or the recipe might take more time than they’re willing to part with. Personally, I want simply made food (kids provide enough complicated distractions) and not have my kitchen destroyed while cooking it. So traditional prepared Parmesan Chicken is a big NO for me. Breading, frying, AND baking? I’m out. Plus, I have this teensy OCD issue with grease splatters on my stove. It’s no fun spending as much time cleaning up as you did cooking. Simplified Grilled Parmesan Chicken takes out the complicated steps and mess, but leaves in the flavor. 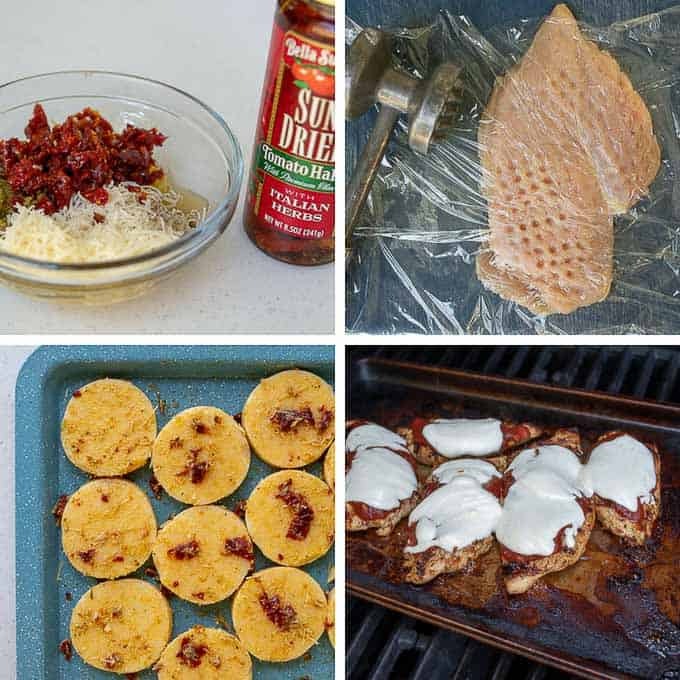 The sun-dried tomato, parmesan marinade is used to flavor both the polenta and grilled chicken. Throw both on the grill, serve with a salad or vegetable, and dinner is done! Mix sun-dried tomato marinade ingredients together in a small bowl. 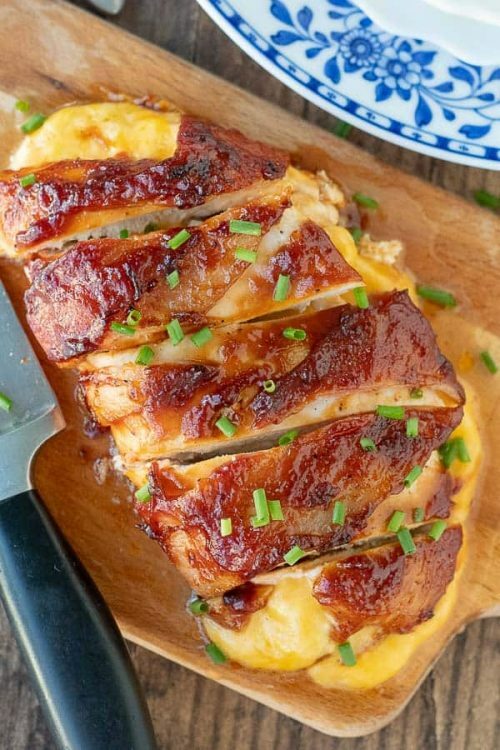 Place chicken on a cutting board with a piece of plastic wrap over it. Using a meat tenderizer, evenly flatten to 1/4″ thickness. Use marinade to flavor chicken, reserving some for the polenta rounds. Use reserved sun-dried tomato marinade to flavor polenta. After grilling the parmesan chicken and polenta, top chicken with marinara and fresh mozzarella. Return to grill for a few minutes to melt cheese. If you can’t find Sun-Dried Tomatoes in Oil with Italian Herbs, add 1 teaspoon of Italian seasoning to the marinade ingredients. The secret to all good grilling is flipping minimally. Once the first side is charred and releases easily, it’s ready to finish cooking on the other side. The grilled polenta rounds are easier to flip once they are crisp, which means leaving them on the grill longer than the chicken. Therefore, start grilling the polenta before the chicken goes on. 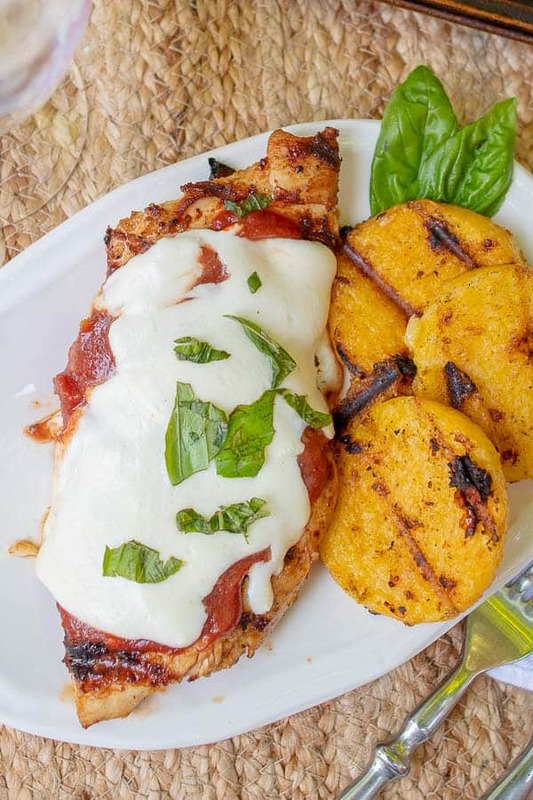 SAVE THIS GRILLED PARMESAN CHICKEN TO YOUR PINTEREST BOARD! Combine minced sun-dried tomatoes, sun-dried tomato oil from jar, olive oil, pesto, garlic, parmesan, salt, and pepper in a small bowl. Set 3 tablespoons aside. 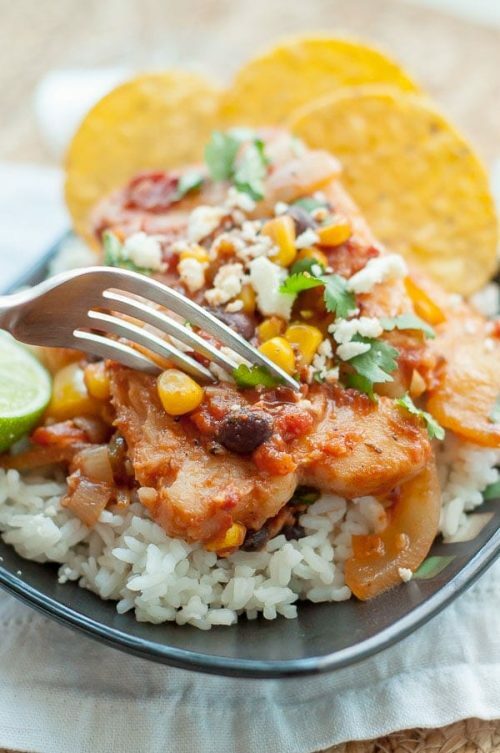 Place tenderized chicken breasts in a large, shallow baking dish. Spread the larger amount of sun-dried tomato marinade on both sides of chicken (I used my fingers.) 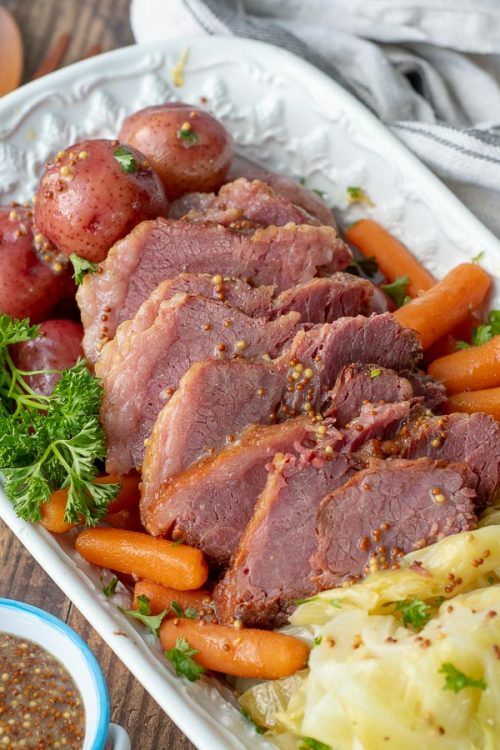 Cover and set aside in the refrigerator for 30 minutes - 1 hour. Meanwhile, place sliced polenta rounds on a separate baking sheet. Spread remaining 4 tablespoons of sun-dried tomato marinade on both sides of polenta. Set aside until chicken is ready to be grilled. Preheat grill to medium high heat and oil grate. Place polenta rounds on one side of the grill to cook, with cover closed, for 5 minutes. Do not flip polenta, but add chicken to other side of the grill. Cook chicken for 4-5 minutes, with closed cover. Then flip both chicken and polenta rounds. TIP: You'll know the chicken and polenta are ready to be flipped if it releases easily from the grill. Cook chicken 4-5 minutes on other side (or until reaches 160ºF). 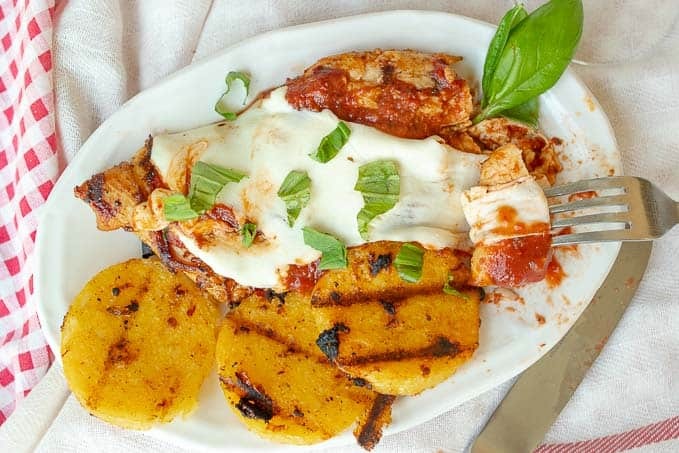 Remove chicken to clean baking sheet, but leave polenta on for about 5 more minutes, or until crispy, grilled, and easily releases. Remove polenta to a plate and keep warm. Divide the marinara over grilled chicken breasts. Lay fresh mozzarella slices on top of marinara. Place baking sheet on grill, close cover, and cook for about 3 minutes, or until cheese is melted. Serve with grilled polenta rounds. * If you can't find Sun-Dried Tomatoes in Oil with Italian Herbs, add 1 teaspoon of Italian seasoning to the marinade ingredients.